Seventy percent of health outcomes are determined by social determinants of health­—areas that involve an individual's social and environmental condition as well as experiences that directly impact health and health status, according to the Pew Research Center in its report, Chronic Disease and the Internet. 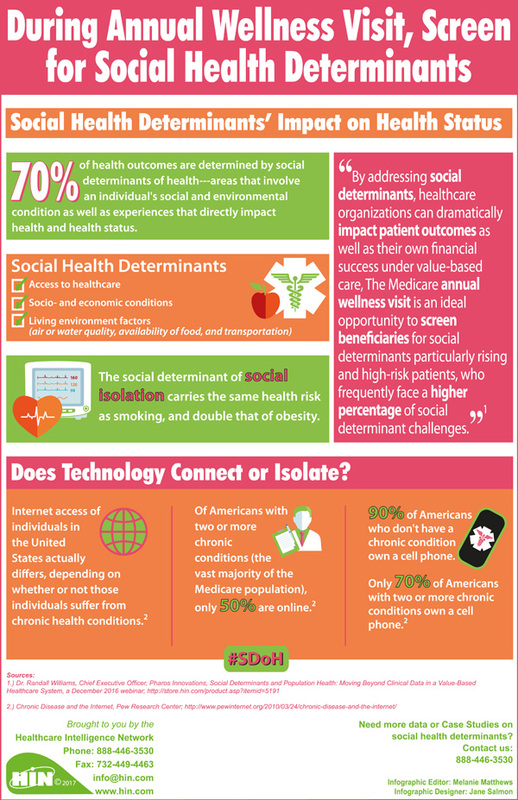 A new infographic by HIN examines the impact of SDOH on health status, why the Medicare annual visit is an ideal time to screen for SDOH and the correlation between technology and social isolation. Identifying social determinants of health (SDH) requires providers to probe beyond the scope of clinical data. But how can health teams ensure that patients and health plan members provide valid data during SDH assessments? In this audio interview, Dr. Randall Williams, chief executive officer, Pharos Innovations, describes three scenarios to build trust and encourage individuals to share sensitive information during SDH interactions. Social Determinants of Health: Does Technology Connect or Isolate? 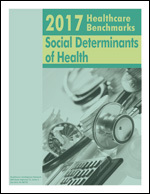 More information on this topic can be found in: 2017 Healthcare Benchmarks: Social Determinants of Health, which documents the efforts of more than 140 healthcare organizations to assess social, economic and environmental factors in patients and to begin to redesign care management to account for these factors. These metrics are compiled from responses to the February 2017 Social Determinants of Health survey by the Healthcare Intelligence Network. This 40-page report assembles hundreds of metrics on social determinants of health (SDOH) initiatives by hospitals, health plans, disease management, behavioral health providers and other responding organizations. This resource offers an exclusive look at SDOH screening tools, priority populations, key workflows, community linkages and engagement, reimbursement trends, impacts and ROI.